Biography: William Thomas Dupree, best known as Champion Jack Dupree, was an American blues pianist. His birth date is disputed, given as July 4, July 10, and July 23, in the years 1908, 1909, or 1910. He died January 21, 1992. On his best known LP, 1958's Blues from the Gutter for Atlantic, he was accompanied on guitar by Larry Dale, whose playing on that LP inspired Brian Jones (of Rolling Stones fame: "Yeah! I have to play this? what a sound"). His biggest commercial success was "Walkin' the Blues", which he recorded as a duet with Mr. Bear. This led to several national tours, and eventually to a European tour. Dupree moved to Europe permanently 1959, the first of many blues stars to make the move to a less racially prejudiced environment. During the 70's and 80's he lived in Halifax, where a bronze plaque has been commissioned in his memory. He continued to record in Europe( with Kenn Lending Band, Louisiana Red) and also made many live appearances there, also still working as a cook specializing in New Orleans cuisine. He returned to the United States from time to time and appeared at the New Orleans Jazz & Heritage Festival. He died in Hannover, Germany of cancer. Review: Champion Jack Dupree was one of the first American blues performers to leave the States and settle in Europe, where racial restrictions were less prominent. Arriving on the Continent in 1959, Dupree was well established and in a good position to take advantage of the British blues boom when it hit in the early to mid-'60s. Never one to let contractual obligations stand in the way of a recording session, Dupree tracked sides for a wide array of European labels, including several for Mike Vernon's Blue Horizon Records in 1968 and 1969, which resulted in two LPs, When You Feel the Feeling You Was Feeling and Scooby Dooby Doo, a scattering of singles, and a live set for a projected third album that was never released. All of that material -- 38 tracks in all -- is presented here in this wonderfully varied two-disc compilation. Dupree began his musical journey as a barrelhouse New Orleans piano player, and elements of that driving style stayed with him throughout his 50-year recording career (he first cut a record in 1940 and was still active as a performer when he died in 1992), but along the way he also developed into a complete entertainer, exceedingly casual and comfortable around audiences, capable of delivering thundering, gutbucket blues pieces, but also able to turn things smooth and elegant (witness his almost Vegas-styled jazz take on "The Sheik of Araby," included on the second disc here). That versatility is certainly on display in this anthology, which features Dupree working both solo and with crackerjack young British blues musicians, and the live tracks included allow a glimpse at Dupree's loose and confident stage manner. Among the highlights in this well-sequenced set are his signature "See My Milk Cow," a stomping version of "A Racehorse Called Mae," a delightfully wry "My Home's in Hell," and the absolutely churning, burning, and rocking "Grandma (You're a Bit Too Slow)." 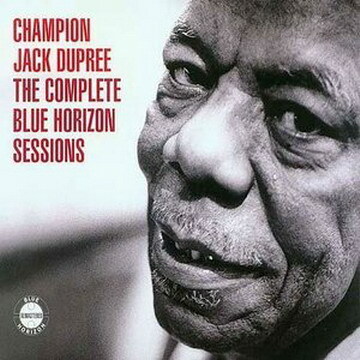 Dupree's huge personality shines through in track after track, and because of that, and because of the variety of musical settings, The Complete Blue Horizon Sessions makes a nice and substantial introduction to this engaging musician.